IMG_4848, originally uploaded by Rob Hutton. Our day at Monet’s garden was interesting. Up as early as we could from the beautiful Gîte, and an hours’ walk from Vernon over to Giverny. On our walk though, seven coaches full of tourists sailed past, so we knew what we were going to be in for. Once we got to Giverny we just wandered around until we found the tourists. Lots of Americans (they talk loudly) and Germans (who tend to push). Once inside the gardens, however, a strange relaxation came over me, despite the crowds, and despite the men in boats in the lilly pond chopping up weed with a lawnmower-like contraption. The garden is always changing; if you’re expecting to see exactly what Monet painted, you’ll be disappointed unless you’re there at the right time of year. But there’s a kind of magic in just seeing what inspired him, and imagining him there in the garden with his canvas, paint and brushes, looking out over his quiet, secluded garden, without the slightest idea that decades later it would be so thoroughly invaded by hordes of rubberneckers. I was quickly drawn in to my photography, and Ris wandered off to spend her own time in the garden, so I was free to play. The challenge became to find a vista without thousands of people in it. Another was to not be too amused by all of the other photographers in the garden, hundreds of them, some snapping photos of every flower in their path as if the memory of Monet could imbue them with some miraculous artistic worth. However, the power of the garden is such that it still seems to be such a peaceful place, despite the heaving throng within it. Monet’s gift wasn’t just as a painter, but as a gardener and a lover of plants. Glad to see your blog isn’t dead! 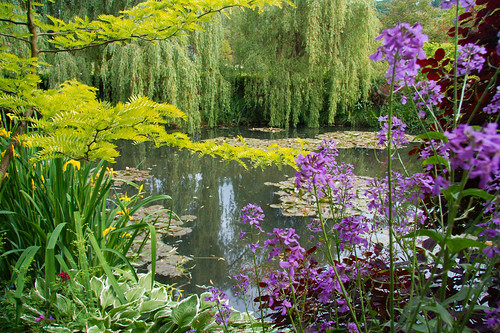 I’d love to visit Monet’s Giverny garden one day. It’s not quite the same, but I do have a wonderful print of one of his Waterlilies paintings – one that I got to see in real life at the Musee d’Orsay (yes I continue to be lazy about accents). What a wonderful life experience to see his garden! I squee in excitement for you both.